We are so pleased to finally share the news and invite you to be a part of our dream for a new music venue in Pittsburgh PA.
What is The Bridge Music Hall? The Bridge Music Hall will be a nonprofit 250-seat, cabaret-style music listening room in the tradition of some of the finest ones in the country such as The Ark in Ann Arbor, The Birchmere in Alexandria, and S.P.A.C.E. in Evanston. A listening room respects the artist and you equally, providing an opportunity to perform and experience music without the distractions of people carrying on conversations during the show. When the music is happening there's no talking! How will The Bridge Music Hall operate? The Bridge will operate as a social enterprise, using a member-supported, nonprofit model that is self-sustainable and guarantees artist pay. Our efforts are entirely grassroots and community-driven. Most of us are working musicians that comprise the diversity within our city. Meet our board and read our business model. What kind of music can I see at The Bridge? Singer-songwriters from Western Pennsylvania and the whole of the United States will be prominently featured. Poetry, lectures and comedy will also be offered. Shows will be presented in a 6-day-a-week schedule. What artists can I see at The Bridge? So glad you asked! We are already attracting and/or hoping to attract incredible talent. Help us bring them all to The Bridge! What else will The Bridge offer? Where will The Bridge be located? This site has yet to be determined, and we are especially focusing on locations on the North Side. We have also previewed locations in the West End and East End. Getting the right location is paramount and we are taking our time to make sure we do this right. Meanwhile, The Bridge is presenting events at Wallace's Whiskey Room & Kitchen in East Liberty every week. While we have been thrilled with the overwhelming response to The Bridge concept, our opening depends entirely upon the financial support of the community. In addition to pursuing grant and city/government contributions we are asking citizens to support this project here at GoFundMe. Thank you for taking the time to learn about The Bridge. Two things: Donate and share. Your donation is tax-deductible. Our total community fundraising goal is $250k. Since launching our GoFundMe we have received around $141k in donations and other financial arrangements, including a grand piano that is being used at Wallace's until our venue is secured. We are 56% of the way there! The remaining $109k we are seeking here will help us to acquire stage lights, state-of-the-art sound, furnishings, as well as initial booking contracts and guarantees for artists, other management fees, and host the grand opening for everyone. Bringing an intimate top-notch listening room to our city and building community around music is our vision and our passion. With your financial help, we will add to the revitalization of Pittsburgh, one of our nation's great Rust Belt cities. We can't wait to meet you at The Bridge. * Compilation Album: a digital download link will be sent to your inbox in this summer! ** Events Ticket Thank You Gift: Selected events TBA. Must be used within 1 year of the opening of The Bridge Music Hall. *** Living Room/Private Concert: US only. Solo or duo only for the $1500 level and trio/full band for the $5000 donation. Selected artists TBA. Must coincide with tour dates and pending schedule availability. Transportation & lodging are not included and additional. **** Dinner Party: This event will be a catered private dinner party for you plus up to 10 of your guests with a national touring artist of our choice, while they are in town to perform at The Bridge. 1) You’ll see our new goal is $109k on the site. This is explained below. 2) For those of you who have contributed $25 and over, the digital compilation album is done! The New Music Sampler Vol. 1 is a sampler of artists in Pittsburgh or from Pittsburgh that have released new music, ranging from Americana to funk to folk to World. There were too many artists to choose from and hopefully we'll release a Vol. 2 someday! 3) You and the Compilation Artists are all invited to a mixer reception at Wallace’s in East Liberty in August. Look for a personal invitation sent separately with all the details. We’d love to meet you! OK. Now to the numbers. It may feel a little abstract but it’s good stuff. First, we have reached our $75k Phase 1 goal! We were able to make arrangements with the person contributing the gear to allow us access to everything upfront. The remaining costs, which have also been discounted, can be folded into our operational budget once we open. Our sincere thanks to the generosity from some good folks for contributing this. This means we are now moving on to Phase 2 & 3 which have a combined total of $175k. When we raise these funds we will acquire stage lights, state-of-the-art sound, furnishings, as well as initial booking contracts and guarantees for artists, other management fees, and grand opening. In an earlier update we shared that we received a donated grand piano which shaves $57k off of this goal down to $118k. Reduce that further by the donations from you here at GoFundMe (right now we’re a little over $9k) and our new Grand Total goal is $109k. So, while our GoFundMe public goal is now a larger number, we’ve received $141k behind the scenes in donations and modified arrangements towards our $250k total goal. Or to put it another way, we're 56% of the way there and only need the final 44%! This is an inspiring development and I felt it was worth sharing with you. Thanks again for your support of this fledgling project. Look for your invitation to our August reception and the new music thank you gift very soon! We wanted to share some good news! Thanks to donor Carolyn Cobb- Meigs, Bridge board member Tom Roberts and piano tuner Jason Leininger The Bridge Music Hall will be the recipient of a vintage Chickering Centennial Grand Piano! This will reduce our initial fundraising from foundations by a whopping $57,000, which was originally earmarked for a restored Steinway. We'll plan for the Steinway eventually but, at least, we'll have a decent piano when we open. Tom thoroughly tested it and gave it the "Roberts Seal of Approval". Until The Bridge can secure its own location the piano will live at Wallace's at Hotel Indigo where we have been running a weekly live music series for the past year. If you've not been able to join us for one of our events, you are cordially invited to attend our GoFundMe party this Thursday, June15. Bring some friends and help us to spread the word. This is how we build The Bridge: one generous contribution at a time. All of it counts so thank you for your part in this. Come enjoy music with us this week! Greetings! We are very pleased with the early weeks of our campaign to build The Bridge Music Hall with community support. Thank you for being early backers. Many are asking where we will be located in the city. It's a great question! We currently have our eye on The Garden Theater, an historic building on the North Side of Pittsburgh. Thanks again for your early support and for the ways you are sharing our GoFundMe campaign with others. Donate any amount $5+ and receive our thanks for supporting quality live music venues, fair artist pay, and our vision to build community and culture! Donate and receive a compilation album* to some of the best new music from Pittsburgh artists that we hope will play at The Bridge. Discover new music here! Donate at this level and receive everything from SOUND CHECK plus + 1 free ticket to an event** at our venue. Come experience The Bridge! Donate at this level and receive everything from WILL CALL plus + upgrade to 2 free tickets to an event** at our venue. Come experience The Bridge! Donate at this level and receive everything from WILL CALL PLUS plus + an invitation to attend our Opening Gala! Celebrate with us! Donate at this level and receive everything from YOU'RE INVITED plus + upgrade your Gala invitation to 1 VIP 'Meet 'n' Greet' pass. We'd love to meet you! Donate at this level and receive everything from VIP PASS plus + upgrade your VIP invitation to 2 VIP 'Meet 'n' Greet' passes. We'd love to meet you! Donate at this level and receive the VIP PASS PLUS plus + a personalized audio greeting from Rich Dieter (founder & voice over artist) for your out-going VM! 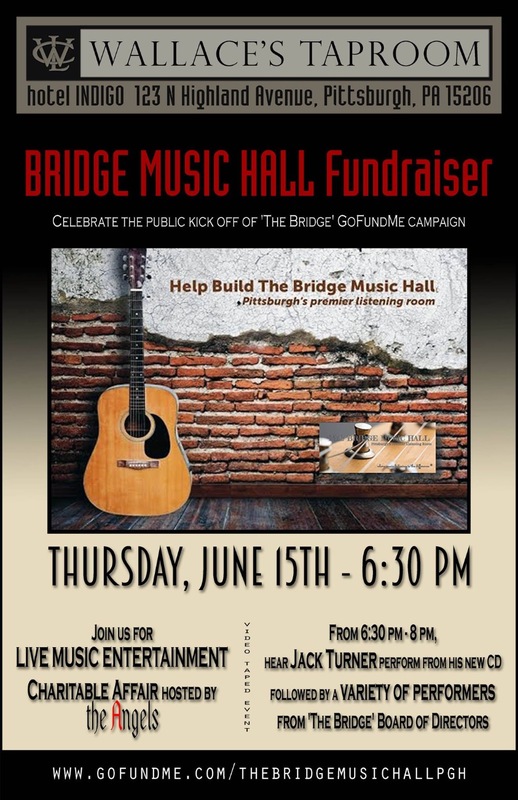 Donate at this level and receive everything from VIP PASS PLUS plus + get a Living Room/Private Concert*** from one of our Bridge Music Hall artists (solo/duo)! 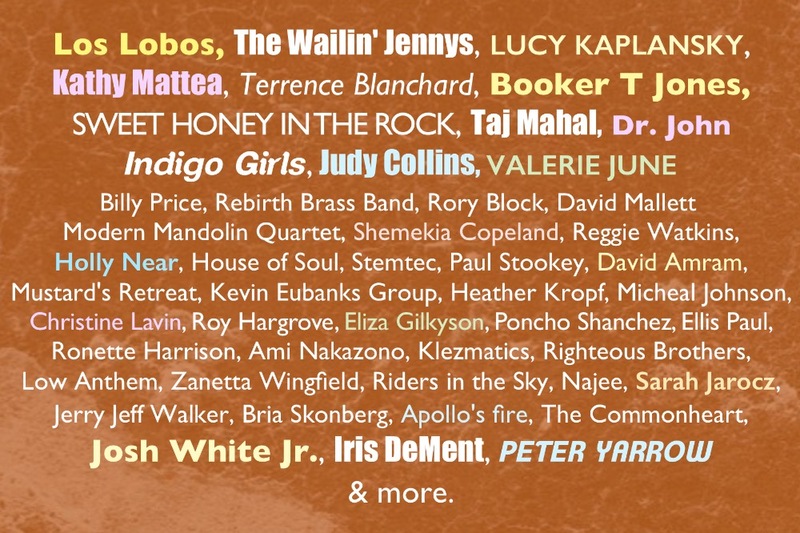 Donate at this level and receive everything from BACKSTAGE PASS plus + upgrade your Living Room/Private Concert*** from 1 of our Bridge artists to the band! Donate at this level and receive everything from VIP PASS PLUS! plus + a dinner party**** for you & 10 guests with a national touring artist at The Bridge!